So, ready for more mathsy goodness? Any number greater than one is a mechanical advantage and the higher the number the better the advantage. The velocity ratio is the distance moved by the effort divided by the distance moved by the load. An easy way to remember it is that it’s the opposite to mechanical advantage, so effort over load rather than load over effort. Last but not least efficiency is exactly what it says on the tin, how efficient is your mechanism? 196% efficient! 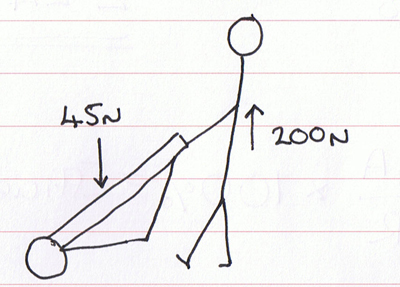 This is because you can lift more than you normally would be able to by using a wheelbarrow.